Ships tomorrow if you order in the next 23 hours 45 minutes. 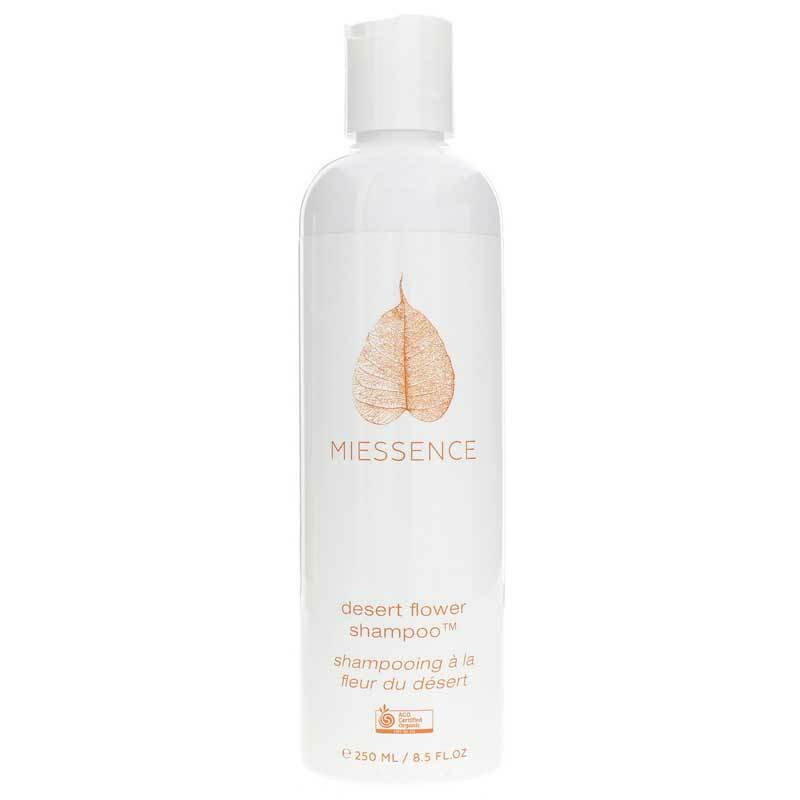 Your hair will look and feel spectacular when you use Desert Flower Shampoo from Miessence. It is specially formulated for normal to dry hair and is ultra mild for every day use. Great for babies and children! Extremely mild Yucca juice and polyglucose gently cleanse the hair. Organic avocado oil restores luster and hydrates dry and damaged ends. Organic herbs add sheen and body to your hair. You may experience a hair detox for the first few weeks if you have been using hair care with silicone derivatives. Your hair may feel knottier and dryer than usual during the detox phase. Be assured, it will improve. Protect B5 Hair Repair will help to detangle and smooth your hair. *Organic aloe barbadensis (aloe vera) leaf juice, coco glucoside, yucca schidigera extract, leuconostoc/radish root ferment filtrate, sambucus nigra (elderberry) fruit extract, d-panthenol (pro-vitamin B5), non-GMO xanthan gum, *organic helianthus annuus (sunflower) seed oil, *organic citrus aurantifolia (lime) essential oil, citric acid, *organic persea gratissma (avocado) fruit oil, * organic equisetum arvense (horsetail) extract, *organic urtica dioica (nettle) extract, *organic arctium lappa (burdock) extract, *organic rosmarinus officinalis (rosemary) extract, *organic salvia officinalis (sage) extract. Limonene is a naturally occurring component of essential oils used in this product. Shake well before use. Massage a small amount of Desert Flower Shampoo onto scalp and allow shower to rinse suds through length of hair. Repeat. The second wash will lather more than the first. Follow with Shine Herbal Hair Conditioner. This is a great shampoo if you're looking for an organic shampoo that doesn't contain SLS, foaming agents, or a host of other chemicals. While it may take two washings to get the suds you want, it will still leave your hair feeling clean and light. I wanted to love Desert Flower Shampoo Travel Size, but it just didn't work for me. My hair became terribly knotted and dry. The watery consistency also makes it hard to use without wasting some. I use this on my own hair and as a shampoo/body wash/bath foam for my 3 year old and 10 month old sons. I've been looking a long time for a mild but great cleaning shampoo that is natural and non toxic and that does not smell bad. I think I have found it! The only negative is that it is very liquid consistency. I would prefer it be thicker so it doesn't run out of my palm so easily, otherwise Desert Flower Shampoo is almost the perfect shampoo, with the creamiest, softest lather ever. 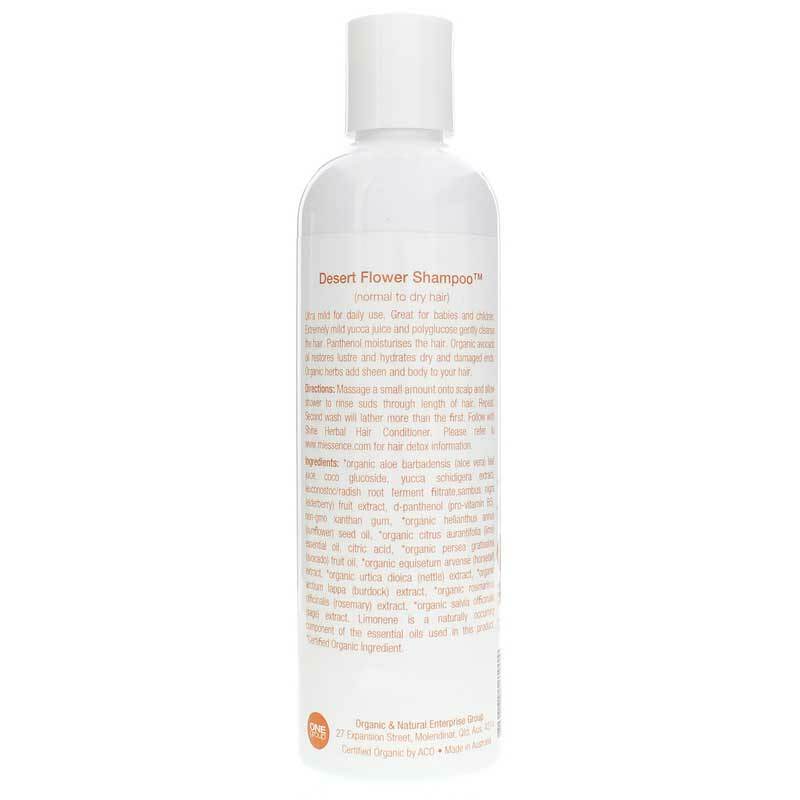 Desert Flower Shampoo doesn't irritate my scalp, helps to moisturize. It would be nice if the price could come down, or there could be a much larger size at this price. Have been using Desert Flower Shampoo for over 18 months and have seen my hair become silkier feeling and thicker looking. Each time I purchase I search for the best price, Natural Healthy Concepts have beaten everyone elses prices each time. Ordering through the website is easy and I'm kept informed on the status of my order. Delivery typically takes 3-4 business days to reach me. At first I detoxed, using shampoos w/ chemicals previously & hair felt dry. But I found my hair now loves this shampoo. My hair is soft, clean, fresh. I love that you can basically 'eat' this shampoo (yuck) because it's made out of ingredients all from the earth. So many shampoos say organic or natural, but are still laden w/ chemicals. We are being assaulted by more and more chemicals, and hair absorbs everything. Great way to add to health regime. At first I detoxed w/ this shampoo, since I used shampoos w/ chemicals previously ... so hair felt dry. But I found my hair now loves this shampoo. My hair is soft, clean, fresh. I love that you can basically 'eat' this shampoo (yuck) because it's made out of ingredients all from the earth. So many shampoos say organic or natural, but are still laden w/ chemicals. We are being assaulted by more and more chemicals, and hair absorbs everything. Great way to add to health regime. Can't say enough good things about this company ! Great customer phone service, wonderful line of products, excellent prices, fast, well packed free shipping.